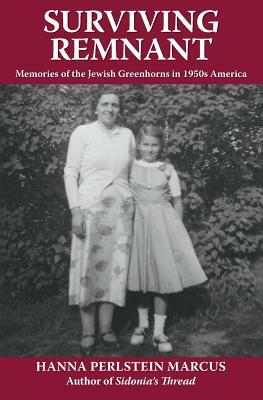 How does a young girl search for a benevolent father figure and suitable husband for her single mother among a group of Holocaust survivors? Set in the deteriorating north end of Springfield, Massachusetts in the 1950s, Surviving Remnant is Hanna Perlstein Marcus' sequel to her award-winning memoir, Sidonia's Thread. Surviving Remnant recreates the author's childhood community of ambitious, humorous, and resilient immigrant refugees who occupy an apartment building, eager to adapt to their new homeland and build new lives for themselves and their children in the aftermath of the Holocaust. Along her hapless search for a father, Marcus becomes a fanatical Brooklyn Dodgers fan, a misguided violinist, a somnambulist, a neurotic, a hopeless matchmaker, and noted fashion model for her mother's stunning designs. Marcus' experiences growing up with her mother in an enclave of Holocaust survivors portray a story no one knows--until now. Surviving Remnant is an authentic look at a moving immigrant saga from deep inside.